I was recently interviewed for The Manila Folder podcast. You can listen to the 30 min interview here. 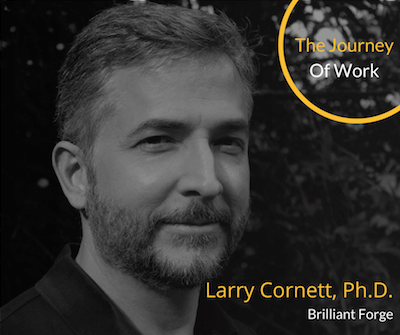 On this episode I sat down with Larry Cornett, Ph.D. and we talked about his work journey. Larry started his career at IBM and then moved over to Apple, while finishing his dissertation for a Ph.D. in psychology from Rice University. He tells an epic story about Steve Jobs, who had just returned to the helm of the iconic brand. It’s pretty classic. He continues his career at other great companies in Silicon Valley, including eBay and Yahoo where he was promoted 7 times in 7 years, landing a role as a Vice President. But it doesn’t end there. His journey includes being a start-up founder and now a career advisor to Gen X leaders. You may be asking, how did a VP at Yahoo become a venture backed start-up founder and then a career advisor? It’s a great question, with an even greater story as an answer. Larry’s journey and his advice will make you think. This one’s definitely worth listening to.